Numeroff is going to milk this cash cow for all that it's worth. I had an idea for a new book. "If you give an author a best selling book, she's going to want 50 more just like it." The original pig and mouse ones are funny, but I'm not a fan of milking ideas dry and I'm afraid that's what this book does. This is another book in the "If you give...book" series. This book starts out "If you give a pig a party and then goes through a list of things the pig will then want. This continues through the book and ends with "and chances are she's going to ask you for a party," which is the same way the other books in these series end.Children seem to love these books and the have the same few characters in the series and the same story idea with just the circumstances different. I would use this book as a read-aloud to a Pre-K to Kindergarten class and also have available for independent reading for grades K-2. 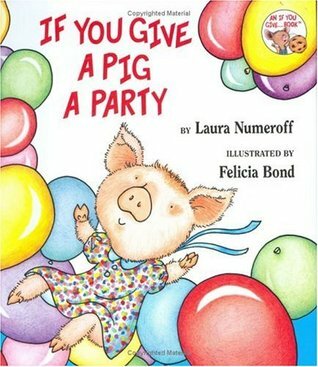 This book was about a pig and she put on a party.She wanted her friends to come so she went to go find them at the street fair.Yes i did like the book because it was funny and it looked like they had a great time.I think my 2 grade buddy would like this book because she loves to read books like this one. Another in the If you give... series by the collaborative team of Laura Joffe Numeroff and Felicia Bond. It's a fun story, as are all of the others, and the charming illustrations only add a bit of whimsy to the story. Another beloved If You Give a blank a blank book. This story features a pig having a party and all the elements that add up to the party. Personally, I love these types of books, I find them so adorable. I think the story is simple for people to see, and the words flow nicely for everyone to appreciate. These books all give me a sense of nostalgia, and sometimes it makes me sad, but when I get to spread the beauty to children it gives me a piece of my childhood back and brings happiness. I read to the kids in my practicum class the other day, and kids were rowdy, but as soon as I started reading it was like a magic flip, the kids loved this story. It just shows the power of read aloud and how it can almost instantly change a student’s attention and focus levels especially if it is a cute enjoyable book as this one is. This book is similar to the famous Mouse a Cookie book, but has some really cool things for my almost 2-year-old.The best page is when the pig plays hide and seek and the reader can search for all the different animal friends. It's like a hunt and find book for a moment.There is another page with bumper cars with fun numbers on them. My kid is learning numbers and so it's fun to look at that page too.The pictures are a lot of fun and are unique. (As a mom and reader of lots of picture books, I've come to appreciate good art and I like it when the illustrators don't reuse pictures one book to the next). This book is with the same character as pig a pancake and of coarse the pig is having a party so it wants balloons then to decorate the house and so on. This book is similar to all the other ones in the series just want a different theme and a different character. I love all of these books. Laura Numeroff is so creative with her style and how she creates a huge story over a simple character. Will never stop loving all of her books. This book is full of imagination and colors. In a class discussion this book may allow me to teach the children what can be done while planning a party. As well as how to stay calm in a situation where many things are happening in a short period of time. Although it is a fun and creative book I will probably not use this book to teach. Same thing. The "if you ..... then..." formula. I find the whole series of books not engaging. One page after another are kind of forced to be each other by glue. If the book ever comes apart in little hands, you wouldn't be able to put it back together without page number, by following the plot line. After the first page, it could be any page really. Same formula as all the other "If you give a [ ] a [ ]". Maybe I have read "If You Give a Mouse a Cookie" too many times, but once you read one of these, you really don't need to add another into your life. I've read a great many of the "If You Give A..." series, and every kid that's come through my daycare has LOVED them as well. It's so much fun to watch their eyes light up at the colorful pictures, and how much they can relate as they bounce around from object to object. Not a fan of these books because they show no attention, self discipline or ability to complete a task. A fun and entertaining story to read that certainly keeps children engaged! It usually makes my Kindergarteners giggle. This was just as charming, endearing, and entertaining as If You Give a Mouse a Cookie. This was one of my favorite books when I was little. I had forgotten about it. I adored this book. A well written spin off to the original "If you Give a Mouse." The illustrations are bright, and catch my young child's interest. The font could have been a little bigger. My mother used to read If You Give a Mouse a Cookie and If You Give a Moose a Muffin. I love these books and this book is just a cute. I absolutely love these books. Creative book with a clever circle-back ending. Very formulaic if you read the other books in the series but it seems to work. This brings back so many memories. I love the illustrations in all of the books. This is another one that I really like to read with students. I think because it’s about a party and it’s all exciting to see and think about, and of course the way I read it gives it even more excitement. This one is about giving a pig a party, but she keeps asking for more things. This one I found to enjoy because I felt like it had more of a lesson to it compared to the others. I like this book because they have a sleepover, and at the sleepover they had a pillow fight. I LOVE sleepovers and pillow fights! OK these books are growing on me, despite their lack of rhyming. They're cute. If You Give A Pig A Party follows the story of a girl who tries to throw a pig a party but gets distracted with a string of things that the pig wants afterwards. The girl has to get her balloons, help decorate the house, help the pig find her friends, where on the way she sees a street fair where all her friends are, and so on. If the reader looks closely, they can see the mouse from Numeroff’s hit book “If You Give A Mouse A Cookie”. As well as the other characters from this series of giving an animal something which results in a long agenda of other activities. The illustrations by Felicia Bond are brighter than the first book in this series, “If You Give A Mouse A Cookie”. There are lots of small details that could be easily missed if the reader doesn’t look closely enough. The color palette of this book contains mostly bright colors such as yellow, pink, and blue. There are lots of mixed patterns as well, to match with the theme of a party. For example, in one page there’s an 80’s pattern on the girls jeans, stripes on her flip flops, polka dots on the spokes of a bike wheel, wavy lines with dots on the party hat the pig is wearing and then her dress which is a confetti like pattern. In the next double page spread of the pig and all her friends in go karts, contains even more patterns as each go kart has at least three different colors and patterns on it. There is lots of movement throughout the pages as well. In one spread, half of the girl’s body is cut off as she’s biking towards wherever the pig’s friends are, and in another, we see the girl and the pig almost running off the page with just a small glimpse of the fair in the background. There is always some strong line that indicates the movement of the page as well as the reader’s eye, they’re mostly sharp diagonals or in one case, a vertical line of the animals all piled on the girl’s bike. Overall, the expressive and happy looking characters paired with the short phrases that change position on each page, the journey of the pig takes us all over town and makes us curious as to what might happen next. Laura Joffe Numeroff Felicia Bond - Laura Joffe Numeroff is the New York Times bestselling author of author of If You Give a Mouse a Cookie, Raising a Hero, and What Mommies/Daddies Do Best. She was born in Brooklyn, New York and graduated from Pratt Institute. Laura grew up as the youngest of three girls, surrounded by art, music, and books. An avid animal lover, Laura has always wanted to write a book about service dogs. She now lives in Los Angeles, California.